So I trimmed too much off my canopy. I cut off too much of the back then realized what was left was too wide to fit the aft fuselage skin. The front half would work but I don't have a usable back half. Anyone been in my situation but needed only a front half? I was hoping someone would sell their aft portion rather than paying for a whole new plexiglass. So, I've wanted to build a plane since my dad got an RV4 when I was about 16. I flew a C150/150 at the time, and liked the high wings, plus always liked to explore off the beaten path. So about 2 years ago, while deployed in Afghanistan, I thought to myself that I'd have a plane if only I'd started building about 4 years ago. With the firewall finished I now have all the major components assembled and have to work out how, and in what order, to put these things together. Part of the problem to solve is where the non-metal parts go that aren't covered by the instructions but clearly have to be installed before panels get riveted over them. The project has reawakened after a long winter's nap. Began reassembly of the CH 750 elevator.Skins are cleco'd and now the assembly is ready for rivets. Will start that next weekend and that should complete the elevator. After that, pull out the completed stabilizer skeleton and lay the skin on it. Sure is good to be working on the plane again!! I watched the scratch build videos and purchased some tools from Zenith, a Ridged sander shown in the video, a Rockwell Blade Runner for cutting the form blocks. I highly recommend the videos. I would not have believed you could cut sheet metal with a Plexiglas cuter and a straight edge if I would not have seen it in the video. I purchased a few other simple tool based on the video as well. The Corvair Engine manual and video was excellent and I am looking for a core. 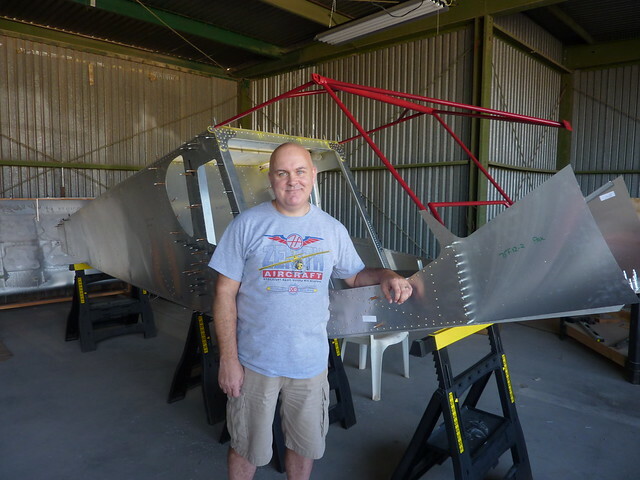 My 601XL-B is now signed off by FAA to begin phase I testing, however, the flight school in Prescott that I was taking instruction at decided to get out of fixed-wing training. Does anybody recommend another flight school/instructor with an "LSA" in Arizona, that I could contact for finishing my "Sport Pilot" lic.? Today was a milestone day, the joining of the two fuselage parts and installation of the cabin frame.